Home Food & Cooking Yogurt Diet: Is It a Hoax or Does It Really Work? Alternative diets are a dime a dozen these days, and that includes the yogurt diet. It’s a short-term meal plan centered around – yep, you guessed it – yogurt. But does it actually work? The skeptics and experts have all weighed in, and here’s what they have to say. What is the yogurt diet? Back in 2011, Yoplait Light yogurt teamed up with actress and wellness expert, Jeannie Mai, along with the host of “The Biggest Loser”, Alison Sweeney, to promote a new diet for people desperate to lose weight. It was called the “Yoplait Light Swap” and it provided people with an uncomplicated way to swap out an unhealthy meal and dessert options with yogurt. Since then, other diet yogurts have emerged, like the yogurt and oatmeal diet. But besides swapping out red velvet cake for a cup of yogurt, how does the yogurt diet actually work? Yogurt diets are a short-term plan that you can follow for up to two weeks. They focus on having yogurt for two meals, along with fruits and/or vegetables, and then one full meal. Yogurt makes up your snacks throughout the day, too. So, what exactly can you eat on the yogurt diet? It’s not a mono-diet, where you only eat one food, which in this case, would be yogurt. Instead, yogurt is the central food. One way to follow this diet is to consume six cups of yogurt every day for six days. On Day 1, you also have four ounces of beef. Day 2, four baked potatoes. Day 3, four ounces of chicken, along with an apple and kiwi. Day 4 adds four ounces of salmon and one mango. Day 5 allows for all the fruits and veggies you can eat. Day 6 is yogurt only. The Yoplait yogurt diet consists of having only one serving of yogurt and one cup of oat- or rice-based cereal at each meal. You should also have one serving of fruit. Snacks consist of raw or cooked vegetables, or a non-fat dairy item, such as skim milk or another yogurt. For dinner, you can enjoy a serving of lean protein, two cups of vegetables and a small amount of fat. The diet promised quick weight loss. In fact, some go so far to say that you can lose as much as eight pounds in three days. But is it that simple? Sure, you can eat yogurt instead of cake. It’s definitely an easy way to avoid unwanted calories and stave off unwanted weight gain. But does the yogurt diet really help you lose weight? Sweeney said that if she swapped out red velvet cake with red velvet-flavored yogurt, she was living a more healthy lifestyle. But was she? Flavored yogurts are often full of added sugars (both real and artificial), preservatives, additives, and colorings. Yes, the yogurt is there, too, but it’s buried underneath ingredients that aren’t necessarily good for you either. A big claim about the yogurt diet is that due to the calcium in yogurt, your brain isn’t as likely to desire food. One study found that while eating any kind of yogurt can help reduce the risk of obesity by 25 percent, if you eat high-fat yogurt, you can reduce this risk even more – up to 36 percent. The truth is, the more sugars we eat – especially those coming from processed foods – the more likely we are to gain weight. And that might be the case with low-fat yogurts. Now, we have to remember that not all yogurts are the same. Low-fat, sugary yogurts may contain some protein, but in reality, they contain little to no fat. They’re mostly sugar. On the other hand, full-fat yogurts or Greek yogurt provide far less sugar, lots of protein and yes, more fat. The combination of both dietary protein and fat may help promote weight loss because they both help you to feel fuller for longer. 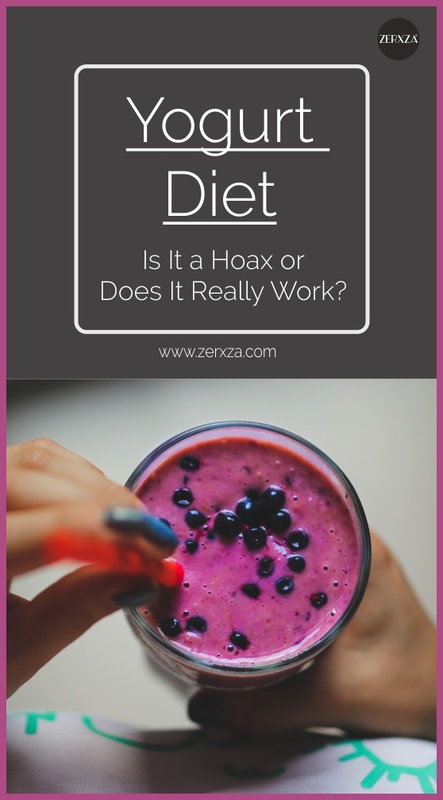 However, here’s the catch: just because yogurt can provide a good source of animal-based fat and protein doesn’t necessarily mean it’s a weight loss food. There are lots of foods that combine fat and protein, and no one’s rushing around saying they’re diet foods. Think eggs, marbled beef, etc. In fact, the Federal Trade Commission (FTC) told the dairy industry to stop marketing dairy as a “weight loss food” back in 2007. Why? Because there isn’t enough evidence to prove it. The yogurt diet is a short-term plan to help you lose weight. While there’s no proof that the yogurt diet can actually help you lose weight, there are some key takeaways you can borrow from it, and integrate into your current diet. #1: Full-fat, Greek yogurt provides a healthy source of protein and fat. This helps you avoid added sugars and can support a weight loss diet. #2: Yogurt, especially unsweetened yogurt, supports a healthy microbiome because it provides beneficial bacteria and keeps your gut flora balanced. If nothing else, try to incorporate more yogurt into your day. Have it at breakfast instead of a sugary pastry. Enjoy it as a mid-afternoon snack, rather than reaching for the junk food. You might not lose weight, but you certainly will help prevent weight gain when yogurt is part of a balanced diet. Next articleIs Playing Hard to Get Really the Best Way to Attract a Man?